When we think of a laboratory, we often have an image of a staid, white environment with little colour. In reality science is a vibrant subject, with some of the most fascinating chemical reactions heralded by stunning colour changes which are clues to what is happening to the molecules at the atomic level. Scientist Krystian Roleder, from the Institute of Physics, University of Silesia, has used a THMS600 Linkam stage to study birefringence measurements for a number of years. Birefringence is also known as double refraction and is a property of a material. When light passes through a material it is split into two beams, a phenomena similar to how the light from the sun is bent and split by droplets within the air to create not just one but several beams of light – a rainbow. 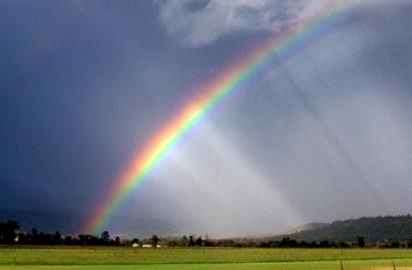 A rainbow is created by splitting beams of light- known as refraction. To test his samples, Krystian Roleder heats them within the stage which creates a corresponding phase change within the material. The clue that this has occurred is the stunning colour changes observed. In one experiment, he looked at birefringence in perovskite single crystals PbZr0.80Sn0.20O3. Slowly changing the temperature from 215oC to 220oC created a change of structural phases within the single crystal: it moved from having an antiferroelectric phase to an intermediate (ferroelectric) one, and then to a paraelectric phase. Photos show the dynamic colour changes caused by the molecular reaction and changing phase.Each change corresponds with a vibrant change in birefringence. Using false-colour techniques (a way to display visual and non-visual parts of the electromagnetic spectrum) such changes are projected onto the computer screen, and it is all thanks to a little temperature stage.